3dcart's integration with eBay allows you to list items from your 3dcart store directly onto your eBay account. Once there, items may be auctioned off to the highest bidder or otherwise purchased outright using eBay's "buy now" options. When items are purchased on eBay, the orders for those items will then show up in your 3dcart store for regular processing as normal. Then, after the items are shipped, an automated action will occur that will update the order (on the eBay side) notifying the purchaser/bidder of their order's status. As with any ecommerce store, eBay lists items in categories to allow potential buyers the ability to locate products easily. Add to this the fact that eBay is well known - worldwide - and you are suddenly presented with the potential to list and sell your items on a much larger scale than your 3dcart store alone. With 3dcart's eBay integration, you no longer have to take your products and duplicate them onto your eBay channel in order to enjoy the additional listing benefits. 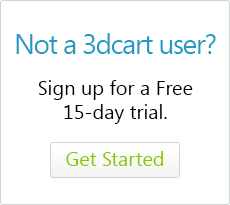 Furthermore, the orders happening on eBay are sent directly to your 3dcart store futher allowing you to streamline your order channels into one location. Items are listed from your 3dcart store and orders are placed on eBay. Rather than listing the same items in multiple locations, you now have the ability to list items from your 3dcart store and process orders for those items all in one location. As items are listed on eBay, inventory for those items is deducted and displayed as being listed on eBay within your 3dcart store, thereby providing better inventory management. If you also have an eBay store, you can import your category structure directly to your 3dcart store as well to keep both stores more uniform. to Prevent orders from being placed by certain buyers or to certain locations which you don't ship to. We've provided the following articles which will help you set up the integration of your 3dcart store with your eBay account. Our original KB Article written during the beta testing phase. It is intended for users already familiar with selling on eBay and contains all information on one page. The articles linked below contain the same basic information in a more compartmentalized fashion with some additional information for less experienced eBay users.